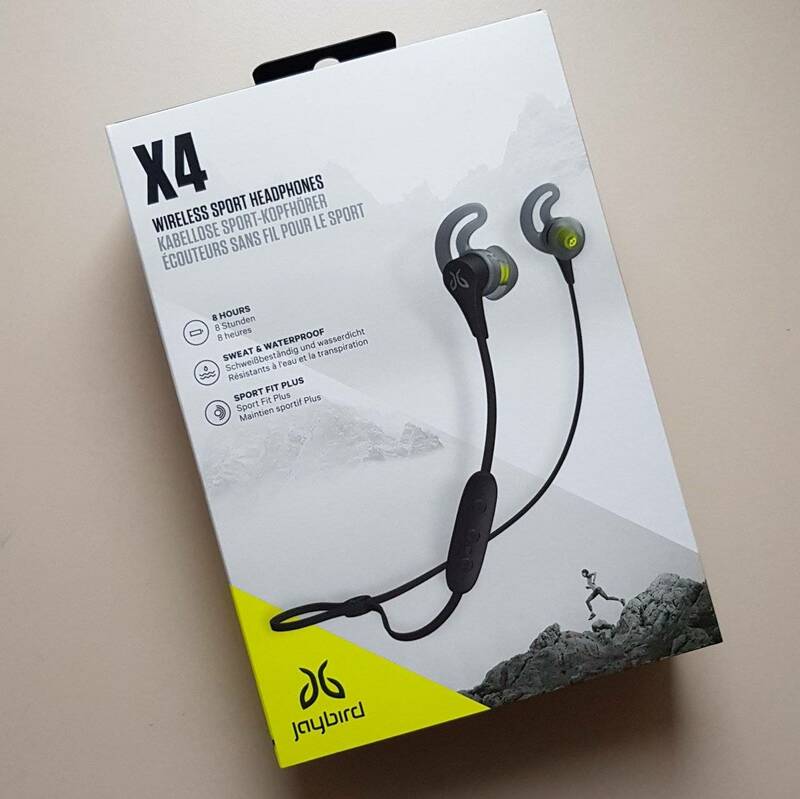 I was used to run with very basic headphones, for my music or for urbirun guidance, that kind of cheap headphones that I can lose or break (yes, I’m clumsy, so what? ), without to much concern. But as soon as you want to take a picture, for example, you have to unplug the headphones and then plug in again, the cable moves under your t-shirt, and every 5–10 minutes you have to move it because it bothers you, etc. .
And as Jaybird kindly sent me one of his wireless X4 headphones, I of course tested it. In the box you’ll find the headphones, a small bag with all kinds of tips, so you’re sure to find one at your size, and that’s really convenient for you. There is also a small clip, if you want to secure the headphone wire to your clothes, but I have never used it. There is a small USB charging cable, on which you simply clip the earphone to charge. Finally there is also a small pocket, very convenient to store and protect all that. Yes, with the Jaybird headphones, there is a dedicated app, so you can make very sharp and precise settings, in fact it’s an equalizer I think. I’m not at all a specialist with sound and music issues, but it’s very easy to use, and you can really adjust the sound to hear the music as you like it. You can of course record your various personalized settings, depending on the kind of music you will listen to. On the app, you also find a selection of playlists, and you can add yours. And in the ears, how does it fit? The headphone itself fits really well to the ear, at least mine, and given the number of small bits you can choose from, it should also be suitable for yours. There is even a small soft rubber “hook”, which helps to maintain the earphones in your ear, and that I find very convenient. If you do not like it, do not worry, you can easily remove it. The sound? It’s just perfect. For sure it’s really different from the headphones I usually use. So if you’re in the middle of the marathon training plan, or if you’re visiting Berlin, Paris or Bordeaux with urbirun, you will be ok : you listen to your music, you hear the urbirun directions, and you enjoy the beauty of the city. And what about the autonomy issue ? I would say : perfect. The battery is very small (it’s actually the control panel on the cable), and for 1 month, I have only loaded it 2 times. I did not calculate precisely, but I probably ran between 15 and 20 runes… A sound tells you the remaining battery level when you connect, and basically, I confirm that the announced 8 hours autonomy is not just an advertising argument. And I used it in very cold conditions, which we know that batteries don’t like. It perfectly fits and stays in the ears. The small 3 switches control panel is perfect. The storage pouch is super convenient. The autonomy is great in my opinion, considering the very small size of the battery.